If there's black ear fungus used for cooking main dishes then there's also snow fungus which has a different consistency. 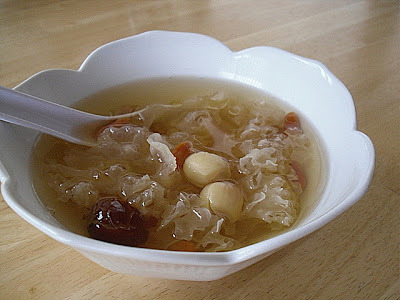 Snow fungus has been used in main dishes though I remembered it being prepared as a dessert. The dish is prepared using snow fungus and rock sugar. So how is this dessert prepared? Here's how according to Little Corner of Mine. It's being prepared by slow cooking the snow fungus in water in high temperature for four hours. After four hours is over, the rock sugar is added to taste. Stirring the rock sugar until it's dissolved. You may serve it hot or chilled depending on one's preference or climate.